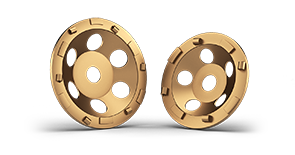 Blastrac has developed two new PCD cup wheels with a diameter of Ø125mm & Ø180mm. The main difference between the existing PCD cup wheels and the new ones is that the PCD is much bigger, so it can cut thick material easier. The extra support segment gives the PCD an increased lifetime and stays sharper & more aggressive for longer. These tools are designed to be fitted on handheld grinders with a working width of Ø125mm and Ø180mm. If you want to receive more information about these new tools, contact us today!